The Trump administration announced Wednesday it will restrict visas for Cambodians “undermining democracy” in the Southeast Asian nation following the dissolution of the main opposition party and a crackdown on independent media. The State Department said it was a direct response to “anti-democratic actions” by the Cambodian government but did not disclose which individuals would be affected. It said visa records are confidential under U.S. law. Spokeswoman Heather Nauert called on the Cambodian government to reinstate the opposition Cambodia National Rescue Party, which was dissolved by Supreme Court order last month, and free its leader Kem Sokha, imprisoned since September. She also urged Cambodia to allow civil society and media to operate freely. Prime Minister Hun Sen, who has held power for more than three decades, has sought to neutralize political opponents and silence critics ahead of national elections next year. Kem Sokha has been charged with trying to topple the government with U.S. support, which Washington has said is a baseless accusation. Supporters of Kem Sokha, leader of the Cambodia National Rescue Party, stand outside the Appeal Court during a bail hearing for the jailed opposition leader in Phnom Penh, Cambodia Sept. 26, 2017. ​Nauert said Cambodia's actions run counter to the Paris Peace Agreements of 1991. The United States and 18 other governments signed the accords, which ushered in democracy after the genocidal rule of the Khmer Rouge regime in the late 1970s, then occupation by Vietnam and civil war. “We will continue to monitor the situation and take additional steps as necessary, while maintaining our close and enduring ties with the people of Cambodia,” Nauert said. 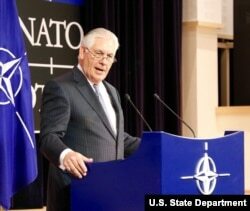 U.S. Secretary of State Rex Tillerson delivers remarks during a press availability at NATO in Brussels, Belgium, Dec. 6, 2017. ​Monovithya Kem, an opposition spokeswoman currently in the U.S., welcomed the visa restrictions and called for targeted financial sanctions on senior officials in Hun Sen's government. Kem, who is the daughter of Kem Sokha, urged the U.S., Japan, Australia and the European Union to coordinate responses to the “crisis” in Cambodia and help win her father's freedom. Like many prominent opposition figures, Kem has fled Cambodia as she fears arrest. In recent months, the government has intensified restrictions on civil society groups and independent media outlets. In September, it shut down the English-language Cambodia Daily. Authorities have shuttered radio stations that aired programming from U.S.-funded Radio Free Asia and Voice of America, whose reports they allege are biased. 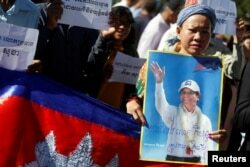 Hun Sen has moved Cambodia closer to China in recent years and become increasingly critical of Washington. However, he’s been complimentary of President Donald Trump. Speaking at Asian leaders’ summit attended by Trump last month, Hun Sen praised the U.S. leader for non-interference in affairs of other nations, but complained the U.S. Embassy in Cambodia was not adhering to the policy.